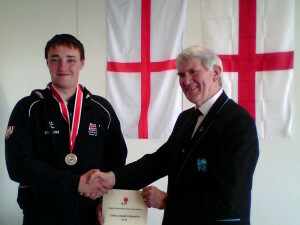 Ben Monksummers receives his medal from David Goodfellow chair of the English Small-bore Shooting Union (ESSU). A marksman from Frome Rifle Club has won a bronze medal in the English Championships. Ben Monksummers eased his way through the qualifying rounds of the 50m rifle competition to earn himself a place in the final, that was made up of eight shooters. The competition, held at the National Shooting Centre in Bisley, included several experienced internationals who he beat to claim a bronze medal. Ben said, “I am really pleased with the result. I hoped to get through to the final but I never expected to do so well once I was there. I beat some internationals and had the top marksmen worried and watching out for my score. “Frome Rifle Club has been instrumental in my success as it gives me a place to train and improve and hopefully progress in the sport. Ranges where we can shoot are few and far between, so I am grateful that the club gives me this opportunity. I am also lucky that I have the support of my family who are all shooting enthusiasts, so it’s in the blood. Ben is no stranger to success at the shooting range having previously won the English Junior Championships, reached the final of the senior competition, and represented Great Britain at the European Championships. He will also represent the UK at the next University Games held in South Korea.